Port forwarding = Temperamental pain in the back side? 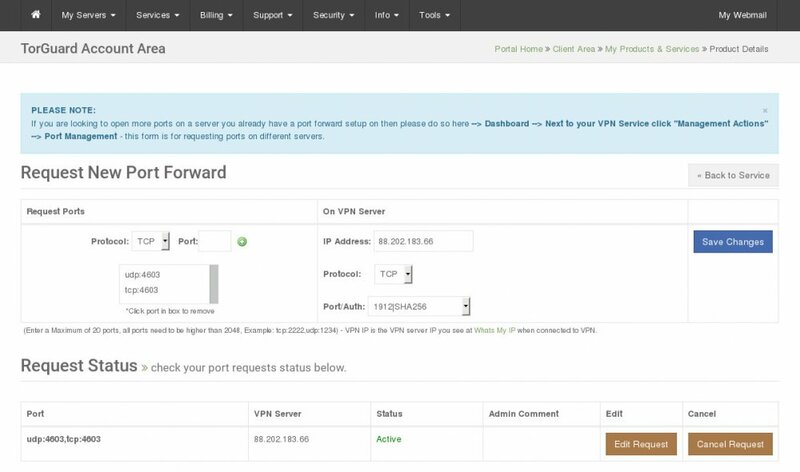 I'm trying to port forward a port on my VPN connection but it doesn't seem to work. I've gone to the port forwarding page and have specified the protocol, port, server IP, vpn protocol and port/auth and it says its active yet qbittorrent says otherwise. Looks like qbitorrent only gives me a green connected icon when i delete the port forward setup on the port management page on the site. Seems like the delete sequence triggers something on the server making it work for a brief second before then getting deleted. This leaves me wondering if I'm missing something here and how the heck port forwarding is meant to be setup? Just checking to see if you had opened both UDP/TCP for the port you are using? I didn’t at the time you asked but I have done previously and again now after you’ve mentioned it. I assume this means in order for it to work the port needs to be open on both UDP and TCP when setting it up in the management page? Becoming increasingly frustrated with this now. Very little left to check or change. This is what I have and as far as I can tell it should work? Does it only work on certain servers or certain VPN ports/ciphers ? Seems like there is very little information about it. What i don't get is how i can probe the TCP port and its open yet obviously the UDP port isn't or something is going astray with with it since Qbit torrent doesn't see it as open. Are you able to submit a support ticket and we can have a look at this for you?